This recipe has been a favorite of mine for awhile. Its pretty easy to make & I can make just two servings easily. I also find by doubling the recipe it makes a nice party dish. It just seems a little fancier serving someone one of these rolls instead of a slice of lasagna. Also if you're like me & like it when the noodles get a little crispy on the edges in lasagna, every serving gets a little crispy this way. I used jarred sauce but if you have time to make some homemade go for it! Boil the noodles according to the directions on the package. While the noodles are cooking mix the spinach, garlic, egg, ricotta, 1/4 c mozzarella, salt, pepper & nutmeg together. Spoon 1/2 cup of pasta sauce over the bottom of a small baking dish, I find a loaf pan works well for this recipe. When the noodles are done lay them out on a cutting board. I use a paper towel to blot some of the moisture off so the topping sticks better. 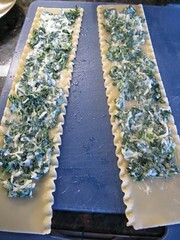 Spread the spinach mixture evenly over the four noodles. 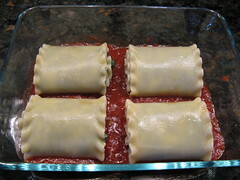 Roll the noodles up with the filling inside & place them seam side down on top of the sauce in the baking pan. Spoon a little of the remaining sauce over each roll. 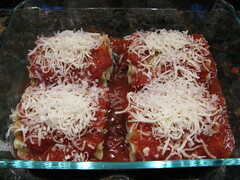 Then top with remaining mozzarella & Parmesan. Makes 4 rolls or 2 servings. You can change up this filling in so many ways by adding things like sliced mushrooms, roasted red peppers or meat. Your blog makes my little college-budget heart go pitter-patter with lust for the delightful food that you make. If only I could afford luxuries with more flavor than a Costco box of Top Ramen. Blegh. This sounds so good. 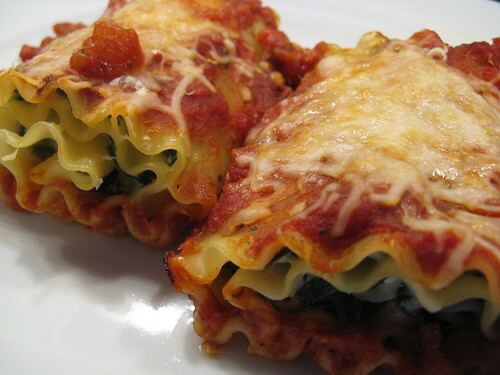 The lasagna slices we get over here are much smaller, about 6 inches I’d say, would be hard to roll up but I think I’ll buy some cannelloni rolls and try it out over the weekend! Great idea. I've had a hankering for lasagna for a while, but was stopped by the thought of putting together a whole pan-worth, when I know the two of us will get tired of lasagna after one dinner + two packed lunches. These rolls sounds like a great alternative. Oooh, I like this idea -- traditional lasagna sits so sloppy on the plate and heavy in the stomach. Great idea!